The U.S. Bank Cash+ Visa Signature Card currently has an Informr score of 7.9 out of 10. This score is based on our evaluation of 11 sources including reviews from users and the web's most trusted critics. U.S. Bank Cash+ Visa Signature Card is typically available to those with excellent credit scores (650 or greater). The U.S. Bank Cash+ Visa Signature Credit Card offers one of the best cash back rewards programs of any card, especially because you can choose your bonus categories each quarter. For cardholders who don’t mind a hands-on approach to earning card rewards, the U.S. Bank Cash+ offers more choice and flexibility than most of its competitors as well as a decent amount of cash back on everyday purchases. Of each transaction in a foreign currency. 2% cash back on one everyday category. 5% cash back on your first $2,000 in combined eligible net purchases each quarter on two categories you choose. With the U.S. Bank Cash Plus Card, you’ll definitely be able to better maximize your cash back rewards due to the flexibility of being able to choose your categories each quarter. One of the downsides of this card is that there is a foreign transaction fee in addition to your cash back rewards expiring after 36 months. However, overall, this card has its advantages with a solid bonus, no annual fee, and the flexibility of choosing your own cash back categories. An ideal everyday credit card for consumers who concentrate their spending in a few choice categories. Thanks to the year-long 0% APR balance transfer promotion, it’s also a strong choice for balance transfer candidates – ideally those who wish to earn ongoing rewards once they’ve addressed their high-interest debts. In the long-term, the U.S. Bank Cash+ credit card can produce significant savings for consumers, as long as they already spend money on the 5% and 2% cash back categories offered by this card. The high rewards rate coupled with the added flexibility of being able to choose your own rewards categories, makes this a great card. Great for people who like flexibility. It’s a solid rewards card with several perks for cardholders to enjoy. However, it also has restrictions that can cost you if you travel like the foreign transaction fee. The U.S. Bank Cash+ Visa is best for those who are diligent in choosing and selecting the bonus categories every three months, along with those who are good at planning their purchases out in advance in order to reap the most rewards. If you like the idea of being able to choose your own rewards while also easily racking up some cash credit, this card would be a great fit for you. Want maximum rewards and major flexibility in how to earn them? 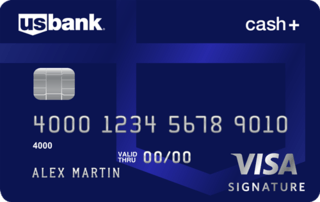 The U.S. Bank Cash+ Visa Signature Card could make your cash-back credit card desires come true. No other personal card that offers rotating bonus categories lets you cherry-pick which ones you want. This card in theory insures you aren’t stuck with categories that don’t fit your spending patterns. The Cash+ Visa Signature is a great fit for those who want options for what earns them 5% and 2% cash back who won’t use the card for foreign transactions.